Former Liberian President Ellen Johnson Sirleaf. Cape Town — Ellen Johnson Sirleaf, who stepped down as Liberian president earlier this year, has been appointed to the advisory board of an elite African think tank which explores ways of financing Africa's development and boosting its competitiveness. This follows her recent appointment as chair of the High Level Panel on Migration in Africa, an initiative of the Economic Commission for Africa. Her term of office in Liberia ended in January, when she was replaced by President George Weah. 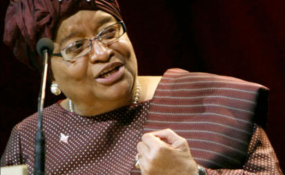 Johnson Sirleaf was named a member of the advisory board of the Brenthurst Foundation in a news release issued by the Johannesburg-based think tank on Thursday. The board is chaired by former Nigerian president Olusegun Obasanjo. The Brenthurst Foundation was established in 2004 by South Africa's Oppenheimer family, whose enterprises - notably the Anglo American Corporation and De Beers - dominated the country's gold and diamond mining industry for much of the 20th century. The family has always maintained a relatively low public profile but as it has scaled back its involvement in business over the past two decades, its current leading members, Nicky Oppenheimer and son Jonathan have turned their attention to promoting economic development across the whole continent. In 2009, Nicky Oppenheimer addressed the Africa Day celebrations at the African Union Commission's headquarters in Addis Ababa. Like the family, the Brenthurst Foundation does not often promote its activities publicly. Its website proclaims that it operates "on the frontier of new ideas and innovative actions for strengthening Africa's economic performance". It says it focuses on three areas: "Encouraging key decision-makers and experts to share experiences and insights at private meetings and seminars; delivering relevant, practical policy advice to governments; and generating new thinking and thought-leadership to address Africa's development challenges." The foundation's news release quoted Obasanjo as saying that Johnson Sirleaf "brings enormous experience and wisdom in taking her country from conflict to peace and democratic consolidation, and in her role as Africa's first woman president". Jonathan Oppenheimer said she would bring "a wealth of knowledge and fresh perspective to the foundation's work". Other members of the Brenthurst advisory board include former president Kgalema Motlanthe of South Africa, former Mozambican prime minister Luisa Diogo, Kansas State University president and former chairman of the U.S. Joint Chiefs of Staff, General Richard Myers, former secretary-general of the Common Market for Eastern and Southern Africa and deputy chair of the African Union Commission, Erastus Mwencha, and former African Development Bank president Donald Kaberuka.